This is a marvellous book. It fills a real need, is well written, enthralling, useful and inspiring. It really made my day to open this book, and I look forward to many hours of learning and enjoyment to come. 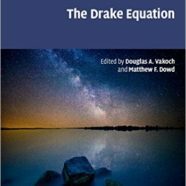 Even non-experts have heard about the Drake Equation, so the book is not only for experts, but knowledge about it is also useful when talking to a non-expert audience. The Drake Equation for ’N’, the estimate of how many civilisations there may be currently detectable in our Galaxy, has been a remarkable heuristic (something that enables learning) tool for SETI (the Search for Extraterrestrial Intelligence). The Equation calculates ’N’ by multiplying together the relevant factors: the rate of star formation in our Galaxy, the fraction of stars with planets, the number of habitable planets per star, the fraction of those that develop life, the fraction of those that go on to develop intelligent life, the fraction of those with technology that releases detectable signs, and the length of time such signs are released. Of course, some of these factors are difficult to estimate, or even define. In this book each factor of the Equation has its own substantial chapter. Each such chapter is preceded by a chapter on the pre-1961 history of the factor, giving the reader a feel for ‘atmosphere’ of the factor. The editors, Doug Vakoch and Matt Dowd, have assembled experts on each factor – astronomers, planetary scientists, biologists, neuroscientists, epistemologists, scientific and cultural historians, and SETI experts – so that the most recent advances in each field are covered. They all and the Cambridge Astrophysics Series are to be congratulated. The trouble with the Equation is that it is at once simple and complex. It starts out as a way of separating out all the factors that determine how many technological civilisations on the surfaces of planets are currently detectable with our technology. But since these factors can be laid out straightforwardly, there is a temptation to think that the whole thing is a complete analysis. But there is a meta problem in that the Equation only deals with this one type of ETI. For example, what do we mean by ‘detectable’? By the technology that we have now, or will have in the future? What about the possibility that ETI has spread to every planet in the Galaxy, or has retreated to a neighbouring dimension? Under different reasonable assumptions, value for N can be plausibly given as zero or billions. So if I can complain about anything in the book, it is the limited discussion of ETIs outside the scope of the Equation – for example civilisations either originating or currently residing in places other than planets – and the interplay between detection methods and types of civilisations – where for instance is the Kardashev classification? Also, the evidence that ‘N’ is zero from the Fermi Paradox and from the Anthropic argument about the late emergence of technological intelligence in the habitability age of the Earth is not well covered. The index is rather short, but there are copious references.